Welcome to 2013, dear readers! It seems as though December blew through faster than expected, and the Dice Hate Me halls have been rather quiet during the holidays. However, things are back in full swing here at the HQ and just in time to ring in the new year with a look back at the best and brightest of 2012! The past year was incredible for the boardgaming hobby… and for Dice Hate Me. We travelled to a ton of conventions, meeting so many wonderful and enthusiastic gamers – and, of course, playing games! Last year about this time, I called 2011 the year of the Kickstarter. Well, 2012 absolutely blew that title away. It was an incredible year for independent game companies, and we are very thankful to have added VivaJava: The Coffee Game and The Great Heartland Hauling Co. to the roster. 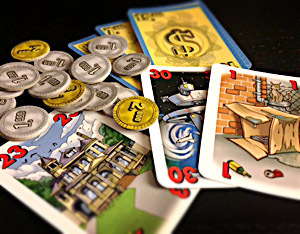 There are big things in store for 2013, like Unpub 3 and the Kickstarter launch of Compounded on January 18. But first it’s time to honor what I feel was 2012′s best titles. It was a tough choice this year, and many great games couldn’t make the top 3. A couple of my choices might be controversial to some, but I’m sticking by them! Just as a clarification to the process, the Game of the Year Award is open only to those games that were published in 2012. 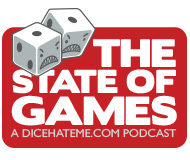 But, just like last year, in order to honor those games that graced our gaming table for the first time this year but were published before 2012, I am continuing to announce the Dice Hate Me Discovery of the Year Award – and that choice was almost as tough as for Game of the Year! So let’s get on with the choices, and happy gaming in 2013! So for those of you dear readers (and listeners) who were paying attention in 2012, this salty selection will probably come as no surprise. I almost called it as Game of the Year back in March when I first played and reviewed this Kickstarter feel-good game, and it stuck with me throughout the year. Every title that hit the table was contending against this early favorite – and in the end, I simply couldn’t justify another pick that could top it. Since its release this fall, a lot of gamers have bemoaned the auction, or debated on and on about how overpowered the Shrimp (or Cod or Processing Vessel) license seems to be – but for those that have stuck with it and have fished deep into its balanced and nuanced depths, they’ve reaped a satisfying bounty of gaming goodness. Controversial or not, I stand by Fleet not only as my favorite game of 2012 – but one of my favorites of all time. And if any of you landlubbers have any doubts, I’ll challenge you to a fishing tourney any day, anywhere! Fleet is a game for 2-4 fishing fanatics, ages 10 and up, by Ben Pinchback and Matt Riddle for Gryphon Games. Make no qualms about it I am a time travel junkie, and for years I had been wishing for a solid, quirky board game that could capture some of the essence of Chrononauts, add a bit more depth and strategy, and make my quantum-addled brain hurt. As it turns out, 2012 was to be the year I finally got my wish. Legacy: Gears of Time came completely out of left field to land, thankfully, in my hands. I had missed the Kickstarter campaign completely, but was lucky enough to happen upon Floodgate Games‘ booth at GenCon and meet designer Ben Harkins in the flesh. We agreed to a little exchange – one shiny time travel game for a certain game full of coffee goodness – and the rest is history. Or the future. Maybe the present. Some gamers have found the scoring and timeline resolution a tad fiddly, but once you wrap your noodle around all the temporal shenanigans, it’s a walk in the Jurassic park. Regardless, Legacy is unique, a lot of fun, and a welcomed quirky addition to the Dice Hate Me boardgame shelves where it will undoubtedly be pulled out time and time again. Legacy: Gears of Time is a game for 2-4 temporal tinkerers, ages 12 and up, by Ben Harkins for Floodgate Games. Well, here we are – right smack dab in the middle of a list of honors for independents, Kickstarters and the like and I name a game from one of the biggest publishers in the hobby. I can assure you, it’s not without good reason. As most of you know, I’m generally pretty hard on Fantasy Flight’s releases; after all, I’ve been disappointed by more than a few. But when the big guns at FFG really put their minds to it, it’s almost as if they’re using the Force. As I mentioned back in October when I first got a chance to try my hand at piloting a Y-Wing, I fell head over heels. I love miniature wargaming, but so many systems are convoluted, bloated and more hassle than they’re worth. The X-Wing Miniatures Game encapsulated everything that’s great about flying little miniature spaceships around trying to blow other people up – and left out all the unneeded space trash that tends to accumulate around some dice and a ruler. Sure, it may leave some old-fashioned grognards scratching their beards, longing for more, but for the average gamer, X-Wing is likely to be the perfect galactic gateway. Star Wars: X-Wing Miniatures Game is for 2 starfighers, ages 14 and up, by Jason Little for Fantasy Flight Games. Yes, For Sale. For everyone who has ever played For Sale – and chances are you may even own it – you know instinctively how easy it is to teach, how satisfying it is to play, and how much fun you have with such a simple concept. For those of you who have yet to play it – and Monkey238 and I were guilty of that until Ben Rosset broke it out this summer in DC – it should be in your collection. Go ahead, you’ll see what I mean. Yes, Kingdom Builder. 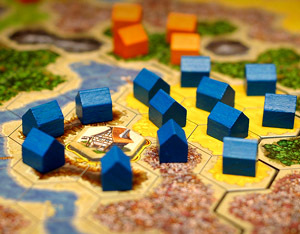 Here’s where some of you are likely to stand up and run screaming from the computer, but there were few board games in our collection that hit the table as many times as Kingdom Builder did in 2012. Easy to teach, a breeze to play, and tons of replay possibilities make this title a shoo-in. And for those of you who don’t think it should have won the Spiel des Jahres, just go back to playing Dominion and let the rest of us have some fun. I can already hear many of you saying “Before the Who?” but give me a chance. I happened upon this little unassuming gem at Prezcon in February when a Mayfair Games representative said that it was one of the most cut-throat games he had ever played. I was a bit wary of that claim – it had cheese and spices and, well, apples after all. But I bought it anyway and once it hit the table I was furious for a good hour – you know, the good kind of furious where you want to flip the table and maim a guy. So, naturally, it was one of the great underdog hits of 2012 for me. Wow. That is awesome. I couldnt be mroe excited. Thank you so much Chris. Matt – Hey, you guys deserve it. Keep making games this good and I’ll keep on giving out awards. Great picks. I have had Fleet and For Sale on my wishlist for some time. Looks like I am going to have to make a New Year’s Resolution to finally pick them up! Awesome! Our GeekDad list will go up next week (waiting on all the other slowpokes to submit theirs), although my criteria is different. I do games that were reviewed on our site in 2012, regardless of publication date. And we have a longer list because, well, I just have a hard time narrowing it down. Have heard so much about Fleet and Legacy: Gears of Time but haven’t actually gotten to play them yet. Maybe I can convince somebody to send me a review copy eventually… I did finally play X-Wing miniatures, though, and it’s great. Kingdom Builder didn’t do it for me, but I’ve only played once so far at PAX and we were all sleepy. May have to revisit that one. Brett – Yes, do pick them up! They are fantastic. Obviously. Jonathan – That’s a shame you haven’t played Fleet nor Legacy yet. They should definitely be in contention. I regret that I didn’t get a chance to play a few other games to put in the running like Manhattan Project, Tahiti and a few others. Also, I feel like Castles of Burgundy would have made my Discovery list had I gotten a chance to play it more than once. I am glad you stood up and proclaimed about Kingdom Builder. I am getting tired of being one of the few to bare the IT ROCKS torch around here. Great choice for game of the year. 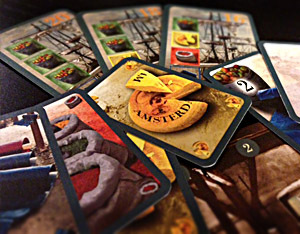 Fleet packs a whole lot of fun into a short game play. Our gaming group loves it. I agree 80% with your choices, at least those I’ve played. Where did you go awry you ask? Kingdom Builder. I can’t disagree with your statement: “Easy to teach, a breeze to play, and tons of replay possibilities”, but I am compelled to ask: Where did they leave the fun?